Want friends and family to give you the respect you deserve? If you've always been the one who says yes, your friends and family may have learned to treat you as an unpaid servant. And naturally, if you've been getting that treatment, you probably aren't very happy. In fact, you may even resent the people you really want to love, appreciate, and enjoy. The solution is to start taking care of yourself by learning to say "No." Instead of serving on every committee – serve only on those that interest you. Instead of tending your neighbor's dog while she goes on vacation, suggest a reliable kennel. Instead of cooking holiday dinners for the entire extended family, offer to host the event as long as they bring the food. Instead of providing a "Hotel with meals and maid service" when friends or family come to town, help them find a good hotel. Instead of picking up the kids clothes from all over the house before washing, folding and returning them to their rooms – leave them until the kids put them in the laundry. Does that sound too difficult? Would you be afraid of rejection and disapproval? If you've been unable to say "NO" to any and every request; and if the thought of saying "No" fills you with apprehension, you're probably in need of the Flower Essence called Centaury. 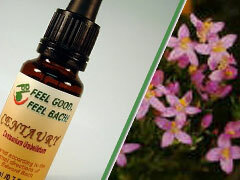 Centaury will help get your energies back in balance and allow you to be free of those fears. Happily, the end result will not be rejection, but a new respect from friends and family when they realize that you do know how to take care of yourself as well as them. Try Centaury now, and enjoy 2013 along with your friends and family. You really don't have to be the one to get all the work accomplished while others relax! Just get on over to FeelBach! to place your order - then get ready to start doing some of the things YOU want to do. Missing the kids and feeling blue?